Morning Motivation — How can you help? Sometimes just what you need to help yourself is to help someone else. It can be a breath of fresh perspective to take the focus off of your wants, needs, desires, and projects long enough to look around at your family, friends, neighbors, community, state, country or the world. What’s going on? Who is in crisis? How can you help? Can you volunteer your time? Can you donate food, clothing, blankets? Can you choose to skip Starbucks two mornings in a row and contribute $10 to those in need? Do it. Expect nothing in return. Receive an amazing feeling. 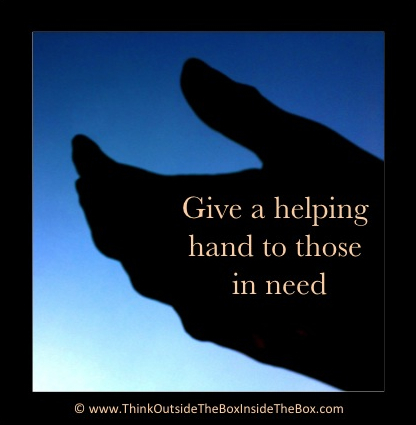 Create from what you have…the ability to help out in your own small way.